July 25 (Bloomberg) -- For the first time in many years, the ruler of London addressed the assembled populus in Latin. Boris Johnson, mayor of the U.K. capital, climbed onto the podium at the opening Wednesday evening of the British Museum's Hadrian exhibition and began spouting classical prose. Then the mayor moved into English, saying, according to British Museum curators who are experts in deciphering ancient texts, what he had just said in Latin. 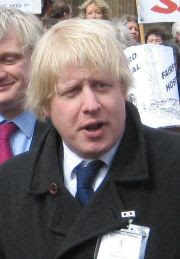 Boris Johnson (natus Alexander Boris de Pfeffel Johnson die 19 Iunii 1964 in Urbe Novo Eboraco) est vir publicus Anglicus Factionis Conservativae et a mense Maii 2008 urbis Londinii praefectus. Scholaris regalis fuit ad Collegium Etonense. The interview of Boris Johnson IS now on line ! http://www.festival-latin-grec.eu/EN and click also on "Jobs and Carrers Corner"